In addition to the normal tour that takes place in the old abandoned building sites, some on board the mine train and partly on foot with experienced guides who will explain to visitors hundreds of years of history, the excavation of the mineral methods, the life of miners, and more, during the day will also be activities to discover the geological and natural environment outside the mine: at the visitor center of the Mining Museum will be able to find the Aveto Park guides that will lead to those interested in short groups themed tours (free activities). In the morning: "boxwood Birds", birdwatching around the Gambatesa mine. 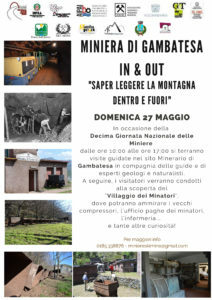 In the afternoon: "The geologist, boxwood and Moth", walk through the geological outcrops and bossete around the mine. We recommend hiking clothes and binoculars. As for the visit to the mine, a reservation is strongly recommended. Sunday, January 7 will be seeking the Epiphany in mine with a cheerful bunch witches to tell stories and distribute sweet surprises to the youngest! 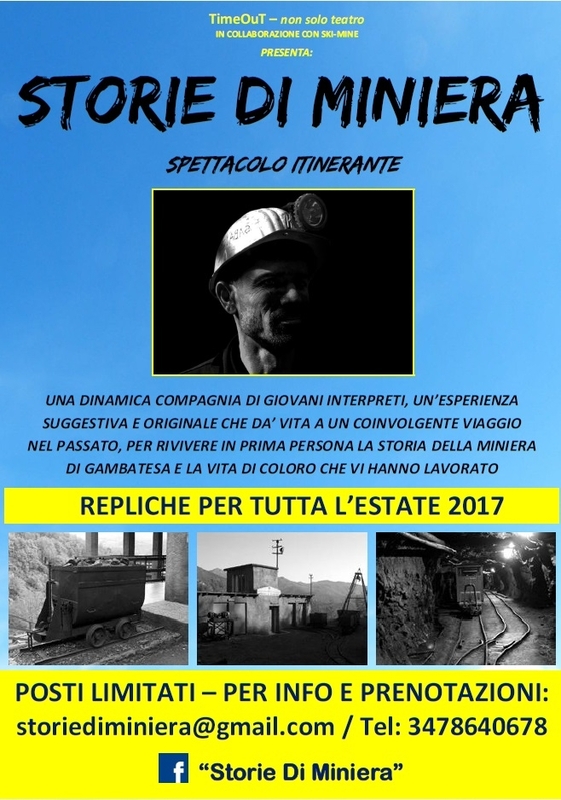 A different way to experience the tradition with the association that offers the successful initiative of 2017 which saw the historic record turnout at the mining site. 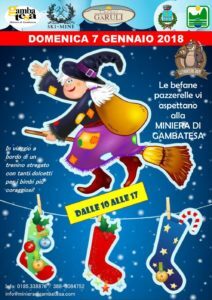 Among witches, train, mine and the sweetness of the event, an unforgettable day for the younger visitors! And Epiphany good at all! 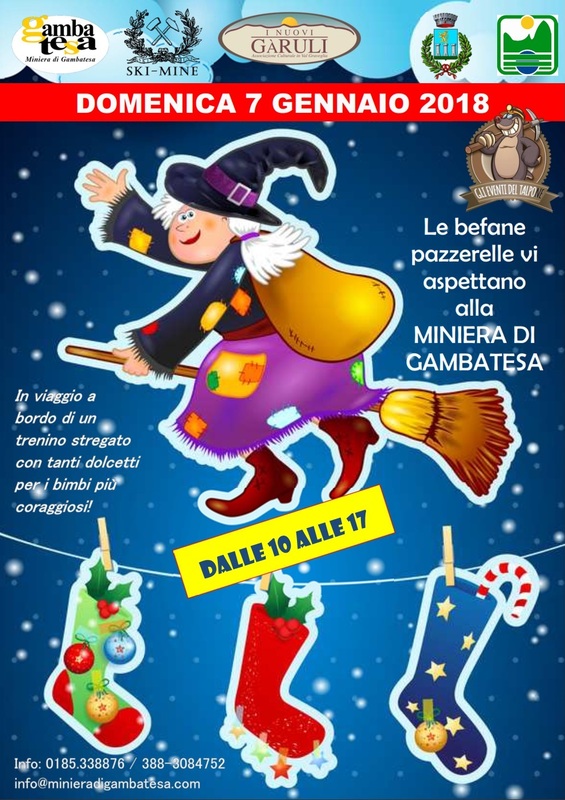 Sunday, December 3 it will celebrate Santa Barbara, the patron saint of miners: an important anniversary for remembering men and women who have sacrificed their lives for the welfare of Graveglia. 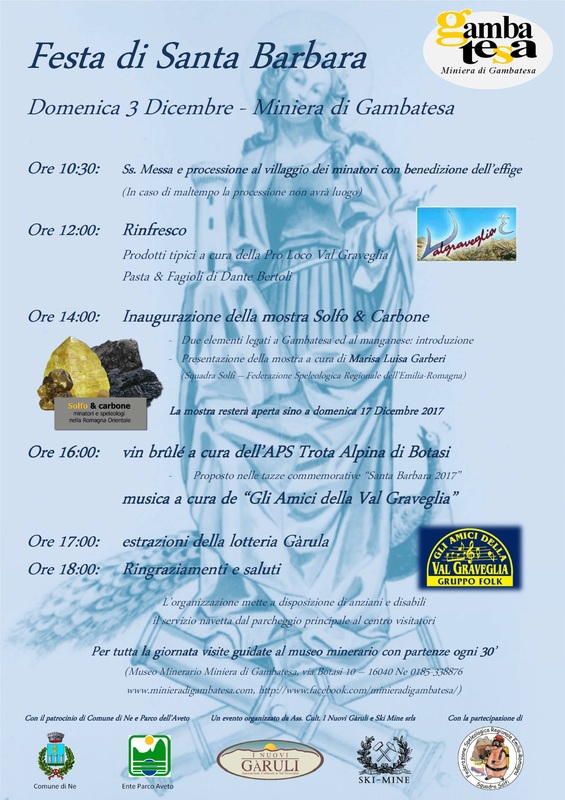 At 17:00 extraction of "Lottery Gàrula", the charity raffle in favor of the cultural association "The New Gàruli". An opportunity to learn about the Gambatesa Mine through a dynamic and original show about the life and work of the miners, their passion and their stories in a unique, charming place, all staged by a company of young performers . AVAILABLE ONLY 25 PEOPLE TO TURN, YOU SHOULD BOOK. We recommend that you dress appropriately (no flip-flop Sandals heels/no/no etc) and a sweater or a sweatshirt. The entire journey takes place in complete safety. 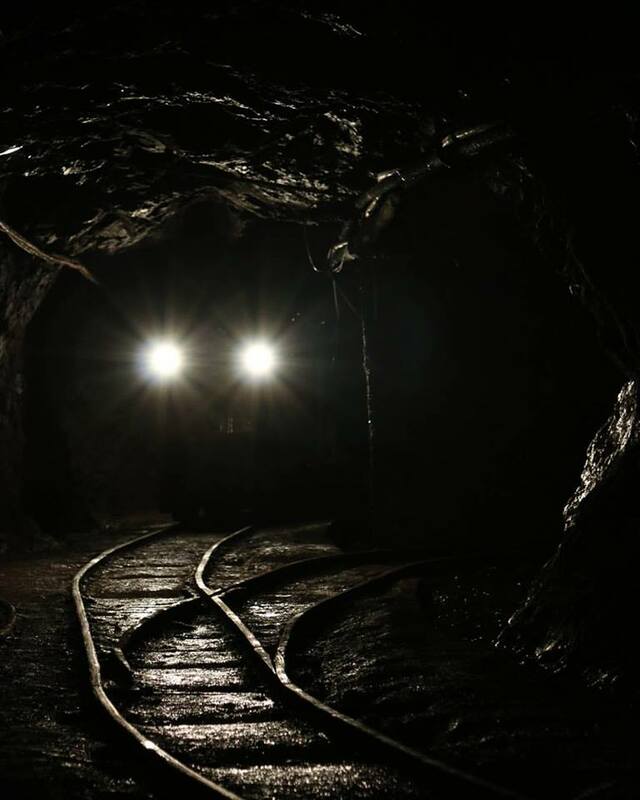 The mining area of ​​Gambatesa proves even more fascinating at night, especially Sunday, August 13: the traditional visits will be added additional departures at 18:00, 18:30 and 19:00. 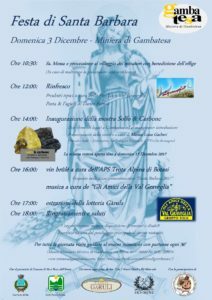 At 20:30 the local tourist Graveglia propose the aperitif with local specialties buffet, from baciocca to red onions stuffed Zerli, all accompanied by local white wine and red. 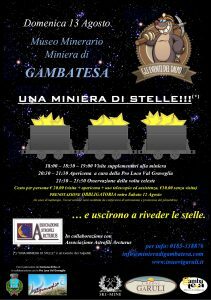 Then at 21:30 it comes alive with the installation of astronomical observation stations by the association of amateur astronomers Arcturus Chiavari which will provide equipment and experts. no later than Saturday, 12. 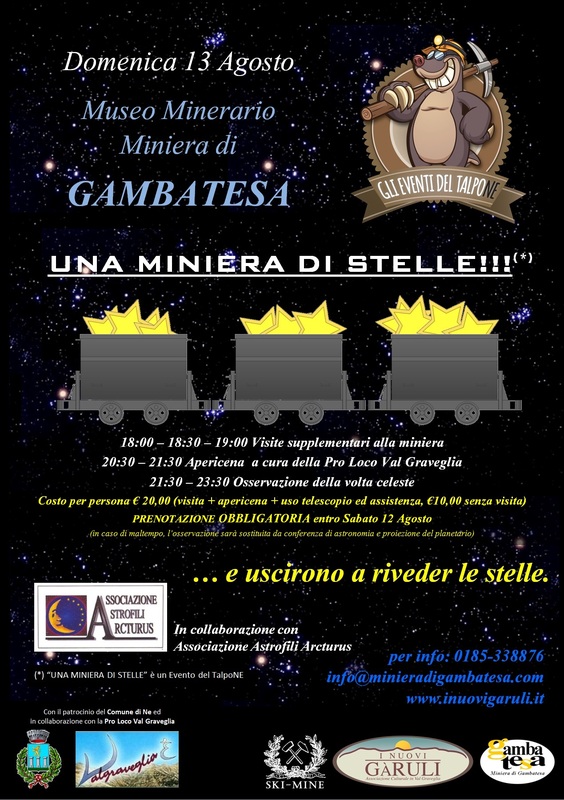 Ticket price: €20.00 per person, including visit to the mine, aperitif and astronomical observation. 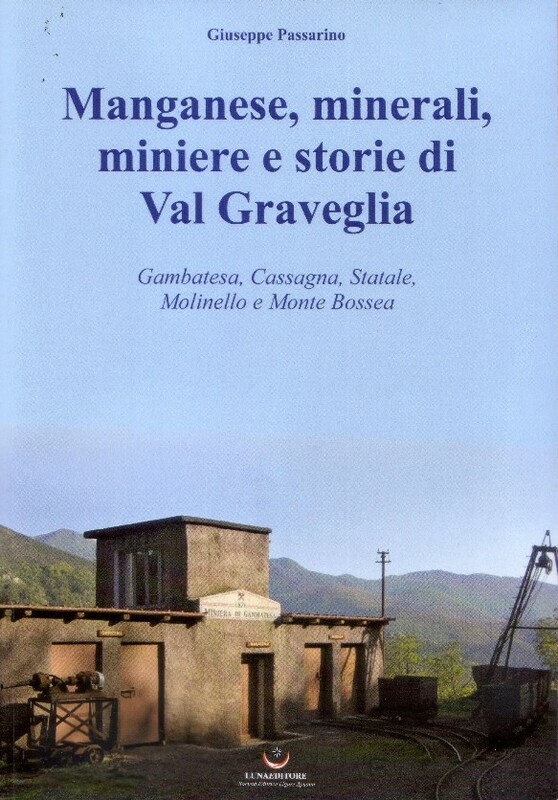 The mining heritage Graveglia recently found, with the reopening of the mine site Gambatesa, its center of gravity, an exceptional example of an industry that has profoundly affected the socio-economic fabric of the valley and the surrounding territory. Liguria has a long mining tradition: if indeed Gambatesa is no mine very old with about 140 years of activity, it is simply due to the fact that manganese is a metal abstract therein only discovered in the late 1700s; But if we look at Iron, copper or the famous slate, then we discover that mining activities in our region have their roots in pre-Romanesque period. 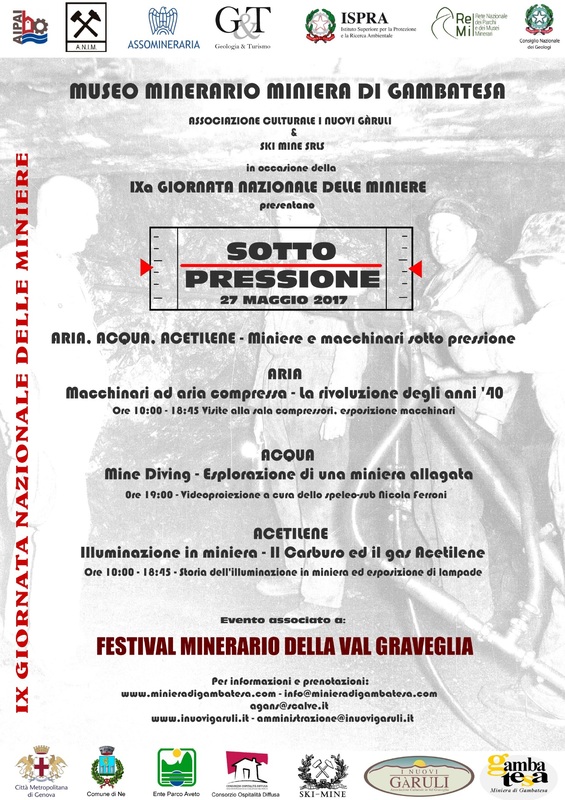 Following the opening to the public of this monument to history and struggle, the Association, in partnership with the Ski Mine Srls (current site manager) organized the first Festival of mining of the Val Graveglia: a two-day event that aims to bring together, in time, collectors, enthusiasts or just curious from all over Italy around this known and appreciated site Museum. 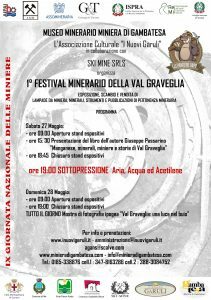 The festivals and associated events is organized on the occasion of IX National Day of Mines. 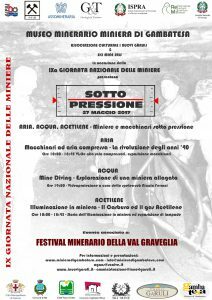 15:30: the author from La Spezia Giuseppe Passarino officially presents the book"Manganese, Minerals, Mining and Graveglia Stories“. 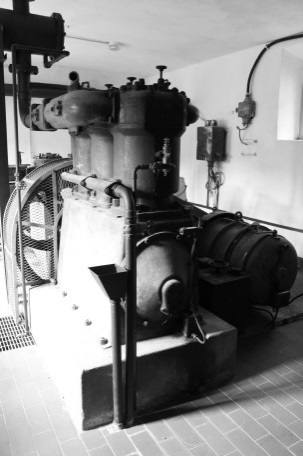 – the official opening of the compressor room of Gambatesa, a place that encloses the industrial core of the site, the beating heart. A place where even today the smell of grease and lubricating oil refers to when the air was compressed and piped in "lungs" before entering the tunnel and distributed in every corner of the mine. 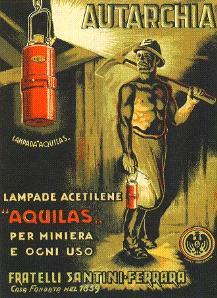 - a series of panels will reconstruct the history and evolution of mining lamps with special attention to those acetylene, the kind that were used in the mining sites of Val Graveglia where Italian lamps "Aquilas" and "Ricceri" were certainly most widespread. – unique patterns and representative of mine lamps will be on show to visitors, in addition to many dishes from exhibitors from all over Italy. 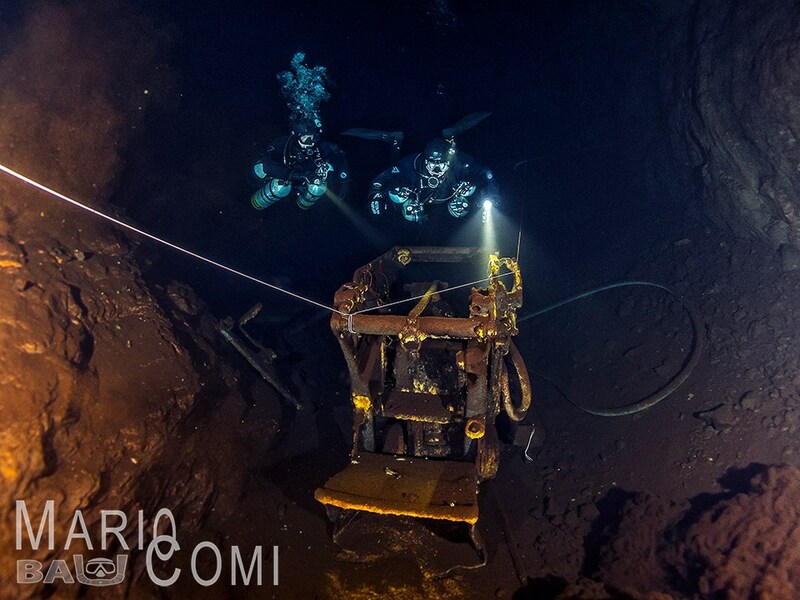 – At 19:00: video projection of the filming of the speleo-diver Nicola Ferroni and regarding the exploration of a mine site flooded; stunning images, a photograph of an extraction site was left as the last day of activity before the water takes possession of each space. An adventure told by those who cultivate a passion with great professionalism, in a complex environment that requires uncommon technical skill. 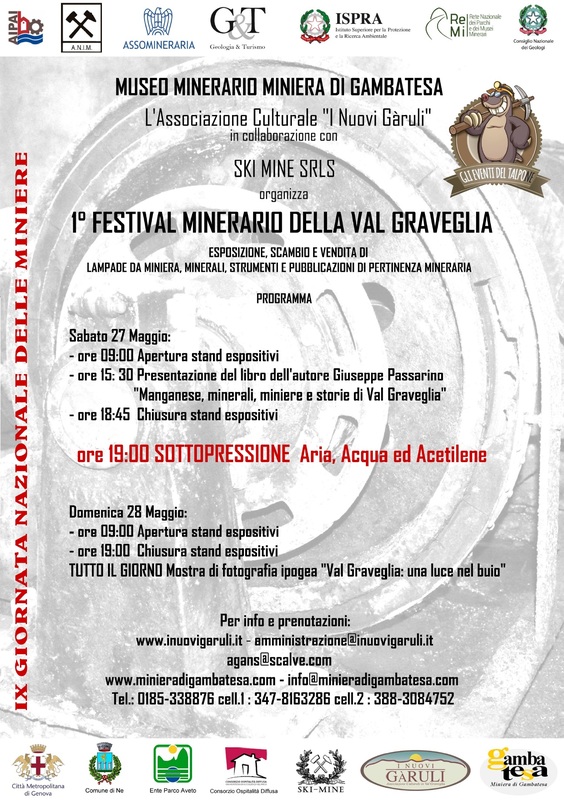 All day: photo exhibition "Val Graveglia: a light in the darkness"; a review of the images used in underground Graveglia and they want to tell, through the images, geology, human impact, industrial archeology, biodiversity of these environments unknown to most. For both days, will be present on farms and local restaurants Hospitality Widespread website Consortium members, who will organize the tasting of local products and food service.